Get prepared for possibly the most consequential year in modern political history. Will you be prepared to answer clients’ questions, reduce their anxieties, and guide them through the new retirement landscape? In the past, we’ve counseled Savvy Social Security members to side step political questions. Teaching the public about how benefits work is tough enough. Getting into complicated discussions of the government budget and the Social Security Trust Fund benefits no one, especially those on the verge of moving from pre-retirement to retirement. But the Trump Revolution changes that. For the first time in more than a decade, Republicans control the complete government apparatus. Long-desired changes to the tax code and Social Security and Medicare, may now have a shot at passing, despite widespread support for the retirement programs. There’s simply no doubt that advisors will face more questions about Social Security and Medicare during 2019. If reform proposals dominate the headlines—a strong possibility—it’s likely you’ll encounter a range of confusion and misunderstandings from clients and prospects. This means you’ll need to have a strong skill set based on understanding how Social Security claiming strategies work. It’s only from that place that you will be able to smartly advise clients and calm their fears about the future. “A 60-year-old prospect came to the office because his 73-year-old wife had just been diagnosed with cancer. He wanted to retire so he could stay home with her. He wanted us to develop an income plan which included his savings, her Social Security, his company pension and what he could expect at ages 62, 66 and 70 from his Social Security. The analysis showed he could retire immediately, wait until age 70 to maximize his Social Security and have enough income until then from annuitizing two of his annuities. Since 2008, Horsesmouth’s Savvy Social Security Planning program has trained thousands of financial advisors from all corners of the industry: financial planners, independent RIAs, wealth managers, wirehouse advisors, insurance planners, CPAs, attorneys, divorce specialists, and more. The most successful advisors fully embrace the Social Security message in their communities. With more than 10,000 Baby Boomers turning 62 every day, they realize their clients and their best prospects hunger for knowledge and guidance about how and when to claim their Social Security benefits. There’s really no better way to meet prospects than to educate them about an important topic in a neutral environment: offices, libraries, colleges, high schools, hotels, restaurants, and professional meetings. People are making big, serious, expensive mistakes by simply claiming, or planning to claim, Social Security at age 62. People’s uninformed decisions mean their retirement nest eggs will unnecessarily be placed under greater stress. These bad decisions make a financial advisor’s difficult job even harder. It’s a trifecta of unintended consequences. But the smart advisors we’ve met since 2008 have turned this into a fantastic advantage. Simply by presenting Savvy Social Security workshops and inviting people to come to their office for a custom Social Security analysis, they opened doors to new clients, new referrals, and new COI relationships. Many advisors describe their decisions to take up the Social Security “Go-to Expert” mantle as the best decision of their professional lives. And what is the payoff? Thousands of advisors have enjoyed record years of growth, year after year, because they adopted the Savvy Social Security approach and used educating clients and prospects to introduce themselves, their services, and their firms. How does that translate into business? For advisors who routinely host Social Security workshops over the course of a year, many gather $5-7 million in new assets per year. Some even gather a lot more. Baby Boomers will soon occupy all Social Security claiming ages from 62-70. In essence, the pipeline of Boomer prospects needing help in retirement started filling when those born in 1946 turned 62. Now, as that cohort turned 70 in 2016, the pipeline is fully loaded with the leading edge, older Boomers right behind them. That’s 37 million Baby Boomers aged 62-70 in their Social Security claiming years. And it will stay that way until 2028—a constant market of 34 million Baby Boomers starting retirement and needing help, every year for the next 12 years. That market is just waiting for the advisor who will serve them and their families, usually for the rest of their lives. It’s an opportunity ripe for picking. That’s why I urge you to step forward now and add Savvy Social Security Planning to your repertoire of client service and business development. You won’t regret it. Because new rules make serious changes to divorce spouse benefits—and a lot of Boomers have divorced at least once. Because survivor benefits for widows are still completely different from other rules. Clients and advisors often get them confused. Because 41 million younger Boomers will need good strategies for boosting their retirement income, including building delayed retirement credits. Because lump sum payment of benefits is going away. People’s expectations will need to be managed. “I explained to a couple that she could take half of her husband’s SS for several years, postponing her SS benefit and letting it increase in value 8% per year. So, where do you and your clients start? What every person needs is a customized, break-even analysis that takes into account their family situation, their life goals, their other resources, and how Social Security fits into their overall retirement plan. The media can’t do that. And the Social Security Administration can’t do that, either. You are the only one who can really do that because you know your client. Everyone wants to know how to get the most out of their Social Security. It’s a perfectly natural response, especially when someone actually looks at what they’ve paid in over the years. Fair enough. But how do they do it? Well, lots of people will do it on their own and maintain a life long pattern of making important investment mistakes because they don’t understand the rules and how they apply to their own situation. But for the advisor who understands the complexities of the system and how to apply them to each client-specific circumstance, their clients will benefit for the remainder of their lifetimes by maximizing their monthly Social Security payments. Simply put, Social Security represents an important opportunity for advisors to provide advice to clients and prospects—regardless of where they sit on the retirement spectrum—on an issue that affects nearly all of them, is very complex, and yet is non-threatening because they are not being “sold” anything. For Boomers with no advisor—affluent DIYers—Social Security is the question that will bring them into your offices. The advisor who does the bang-up job on this crucial question stands a great chance of becoming the main advisor for all their retirement planning needs. 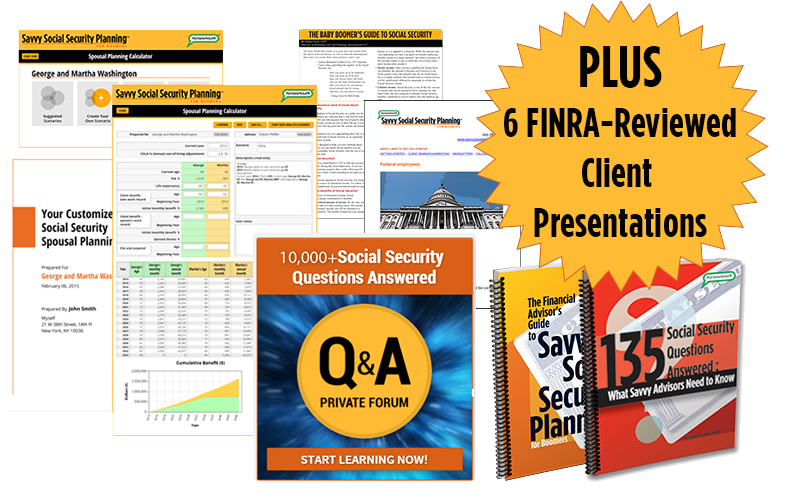 Helping clients and prospects make the smartest and most informed decision about Social Security may prove to be the key that unlocks the door to the big “IRA rollover” issue. No advisor should be lacking for deep, up-to-date knowledge of Social Security. That’s not a super-tall order, mind you. Yes, at first blush, the formulas and calculations and consequences of different options seem complicated. But it’s like anything else. You can gain mastery of these topics in a short time and in a way that will help your clients and build your reputation around town as a retirement planning expert. When Boomer prospects and clients come calling with questions, we don’t want you caught behind the curve on this issue. In fact, we want you to recognize the unique role you play in clients’ lives and get ahead of the curve on the important issue of Social Security and retirement income. We want you, or folks on your team, to be the “go-to” person for all your clients, their friends, their colleagues, and their family members. We want you to be able to lead people through a complete and clear understanding of how Social Security works, how it fits into their own retirement needs, and what their options are for when and how to collect benefits. It’s an important leadership position for you and your firm. And the best way we know to do it is through a full client education program on Social Security and its connection to people’s retirement income plans. Your program is led by Elaine Floyd, CFP®, Horsesmouth’s Director of Retirement and Life Planning. Elaine is the author of The Financial Advisor’s Guide to Savvy Social Security and The Financial Advisor’s Guide to Savvy Medicare. This multi faceted client education program equips you with the knowledge, tools, resources, calculators, and reference material to get you, and then your clients, completely clear about the crucial role Social Security will play in their retirement. You’ll make “Savvy Social Security Planning for Boomers” a key client-service offering for pre-retirees and their friends and families. The coming retirement wave presents a unique and sustained opportunity for you to extend and enhance your reputation. By helping confused clients and prospects better understand all their retirement benefit options under Social Security, you’ll be giving them peace of mind as they move toward solving the rest of the retirement income planning puzzle. FINRA has reviewed the client presentation and client reference material for this program for a member firm and stated, “the material submitted appears consistent with applicable standards.” (Reference: FR2008-12-17-0224/H). Like all such client materials, advisors need to consult their own compliance department. This is a customizable client education presentation—licensed to you by Horsesmouth—to give to your clients or prospects. You can deliver it as a workshop or seminar, or in a smaller setting, even one-on-one. We’ve written a 22-page script for you to use whenever you deliver this program. You can follow it word for word if you like, or customize it to your style to whatever degree you need. You also get a 45+ slide PowerPoint deck that you can customize for your presentation and use to illustrate the important lessons you’ll be conveying to your clients. Under the Savvy Social Security program license, you can deliver this presentation as many times as you’d like, year after year, with a small annual renewal fee. Following your first year, you’ll receive new information each year about changes in Social Security, plus you’ll receive updated: slides, script, online Social Security calculators, and any other aspect of the program that has changed, in addition to more Client Reference handouts (see below). Now you can expand your reach into these three important niche markets with new client seminar presentations on the importance of Social Security. CPAs and attorneys are an advisor’s best source of referrals. They work with clients who also need a financial advisor’s services, and a recommendation by a trusted professional is as good as gold. You can increase your chances of getting referrals from centers of influence by sharing valuable information that helps them in their business. Now that Social Security planning is taking center stage among Baby Boomers, CPAs and attorneys are undoubtedly getting questions from clients about when to claim benefits, how the rules work, and how Social Security fits with the rest of their retirement income plan. You can help them broaden their understanding of Social Security by delivering this one-hour workshop and being on call to serve as an ongoing resource whenever they have questions. Then watch the referrals flow in. CPAs who attend this workshop are eligible for one CPE credit. Social Security financing: what’s in the trust fund, how long is it expected to last? 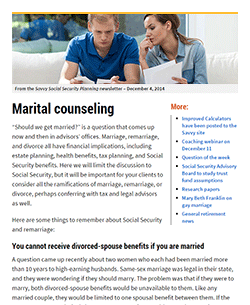 Social Security scenario planning for couples: When should each spouse claim benefits? These are the kinds of questions clients are asking today and they reflect both a desire to maximize benefits and a misunderstanding of the rules. Innovative strategies for maximizing spousal benefits, and how they are changing after the Budget Act. How to claim your benefits and communicate with SSA workers so there are no misunderstandings. Women need Social Security. They may not know this yet, but for women who are afraid of outliving their husbands and their assets, there’s nothing better than an inflation-adjusted income stream that lasts for life. In 2010, more than half of older women derived 50% or more of their income from Social Security. Yet most women are not very savvy about Social Security. If they are married to high earners, they often let their husbands take the lead in making Social Security decisions for the couple and those decisions may not be optimal for the longer-lived spouse. If they are divorced or widowed, they may have no idea how they can take advantage of divorced-spouse or survivor benefits and how they can coordinate such benefits with their own retirement benefit. “Savvy Social Security Planning for Women” shows women how they can maximize Social Security by taking advantage of spousal benefits, survivor benefits, divorced-spouse benefits, and even divorced-spouse survivor benefits. It will open the eyes of Baby Boomer women who haven’t given much thought to Social Security, and may even be the launching pad for finally getting around to addressing their retirement planning needs, including their search for an advisor who can help them with the process. This presentation is suitable for all women, including those already on Social Security as well as younger women who may be helping their parents. Men should be invited too, for they have wives, sisters, and mothers who all need help with Social Security. “Savvy Social Security Planning: Basic Rules and Claiming Strategies” takes the general client presentation and strips out some of the detail, leaving your attendees with a few main points they should walk away with: why delay benefits, how spousal benefits work, how survivor benefits work, and what they should know before filing for Social Security. “What’s New With Social Security? 7 Things to Watch in 2019” is for previous workshop attendees and tells what’s new for 2019, including COLA numbers, Medicare premiums, restricted application eligibility, coordination of Social Security with IRA RMDs, status of the Social Security Trust Fund, and the latest on Social Security reform proposals, of special interest in the first year of a new administration. This workshop will be updated at least annually and throughout the year as warranted. Savvy Social Security Client Reference: When clients and prospects walk away from your Savvy Social Security Planning program, they’ll have a completely new and informed view of Social Security. For many, it’ll be the first time they’ve realized how important it might be to their retirement future. While their heads will be filled with new ideas and insights, you also want them to walk out with a useful information resource that sums up the major points of what they’ve learned and gives them the ability to refer to it in the future as they discuss the issues with family, friends and colleagues. That’s why we’ve created a 3-panel, 6 sided, 8.5" x 11", laminated reference guide on Savvy Social Security Planning (50 copies). This client reference explains the key concepts everyone must consider when making Social Security decisions—the ones you will have walked your clients through during your presentation. The Financial Advisor’s Guide to Savvy Social Security Planning: This 175+ page action research report by Elaine Floyd, CFP® is your Social Security bible—yours to keep. In clear, sharp prose, Elaine Floyd walks you through all the major aspects of smart Social Security planning and equips you with business development insights for how and why to engage clients and prospects around Social Security. This is a one-of-a-kind reference guide that gives you mastery and competence over this important, complicated topic. 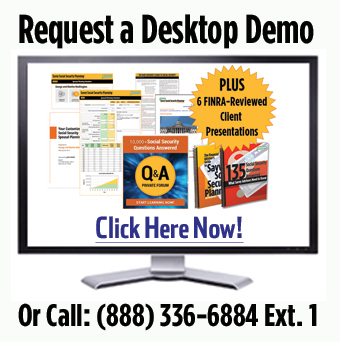 “I had a prospect who couldn’t make it to any of my seminars call me with a question. He said he was 66 years old, his wife was 78 and collecting Social Security. He was still working and wanted to know if he could delay his SS benefits until he stopped. I informed him that he could continue to work, file for a spousal benefit now, and let his own benefit accrue 8% credits until age 70, when he could switch to this higher benefit. Warning: Women who took time out of the work force to raise children may have set themselves up for dramatically lower benefits. Here’s how to fix it. Watch out: Self-employed clients who incorporate their small businesses in order to avoid paying the high SE tax may be setting themselves up for drastically lower benefits in retirement. Find out how to properly analyze their situation. “A client who had been married twice was unaware that she could receive spousal benefits on her first husband. This knowledge helped her plan a better retirement since her SS benefits were less than half of his. Another divorcee who was dating someone on a small SS benefit, did not realize that she could file for a spousal benefit on her ex if she remained unmarried. Warning: Irrational fears and bad information may be driving people to choose early retirement. Advisors should encourage clients to treat Social Security as an insurance policy against living a very long life. How long does a client have to live to make it worth delaying benefits? Common wisdom is that you should retire at 62 to take early benefits and delay drawing down personal assets, right? Wrong! Find out why. Once you start receiving early benefits, you’re stuck forever at the lower benefit, right? Wrong! It is possible to reverse your decision. See the details. Warning: When a person applies before full retirement age, the actuarial reduction will apply even if the person switches over to a different benefit later (spousal benefit to earned benefit or vice versa). Understand why. “I love the materials that you have put together on Social Security. I recently had a visit with my father and stepmother in Florida and we talked about Social Security planning. Which is greater: earned benefit or spousal benefit? Understanding the rules for earned benefits, spousal benefits, divorced-spouse benefits and survivor benefits. What if you divorce in retirement? “I have found that a good percentage of clients plan to take SS early as possible. This comes without any awareness or thought given to some of the consequences and effects on beneficiaries that may have. Avoiding excess tax: One more reason why it may pay to delay Social Security benefits. Reduction in benefits vs. taxation of benefits: helping clients understand the difference. Warning: If clients don’t apply for Medicare in a timely manner, penalties will be applied to future Part B premiums. Warning: One of the most important services an advisor can provide to baby boomers is to help them avoid penalties and gaps in health care coverage by enrolling in a timely manner. “A true story from my own life: while still employed, I took my 62 year old non-working wife to the Social Security office to begin her benefit only to learn that since she did not have her own 40 quarters she would have to wait until I retired. Three years later I went to get my wife on Medicare and was told (erroneously) that a) she had to wait for me to retire and/or start my own Medicare and b) she would have to be covered by a true group health plan for two years while waiting, forcing me to purchase a $1100 per month Blue Cross Group to replace my $400+ per month individual health plan. When the ‘error’ was discovered, it was impossible to make retroactive changes. Warning: Errors are not uncommon in computing benefits. Overages will be collected at a later date. Special rules for clients living outside the U.S.
Online Suite of the Savvy Social Security Calculators: Now create customized reports for your clients analyzing their possible claiming strategies with seven proprietary calculators available for live, web-based use. Includes: Spousal Planning, Breakeven, Retirement Spending, WEP/GPO Planning, Survivor, Divorce and Re-Investing. ($520 value). Simple Breakeven Calculator—This basic calculator helps you advise clients on when to apply for Social Security benefits. It allows you to run two scenarios—apply earlier and receive a smaller amount, or apply later and receive a larger amount. The calculator shows the age the client must live beyond in order for delayed benefits to produce a higher cumulative amount. This calculator is designed for simplicity and does not take into account investment returns if benefits are invested. Retirement Spending Breakeven Calculator—This calculator assumes the client has personal assets in addition to Social Security. If the client retires sometime between the ages of 62 and 70, should he apply for Social Security immediately and leave the personal assets invested, or should he draw from the personal assets first and wait to apply for Social Security in order to build delayed credits? A year-by-year run shows how much of each year’s spending need is met by personal assets vs. Social Security. The objective is to determine which strategy (early or later filing) requires the least amount to be drawn from personal assets to meet the same spending need. Reinvest Breakeven Calculator—This calculator is designed for high-income clients who will not need Social Security to meet living expenses. If their intent is to invest their monthly benefits, should they apply early and get those benefits invested as soon as possible, or should they delay their application in order to receive a higher benefit? At varying return assumptions, the calculator shows the year-by-year results and cumulative totals so you can see the crossover point, or breakeven age, at which delaying benefits produces the higher total amount. 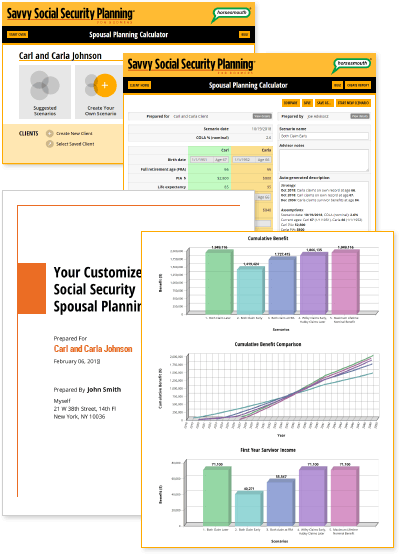 Spousal Planning Calculator—One of the most challenging aspects of Social Security planning is coordinating spousal benefits, especially when the spouses are of different ages. This simple calculator allows you to enter each spouse’s age and respective benefit amount, along with the projected COLA, and see a year-by-year run of the couple’s combined benefits and the cumulative total. Five identical worksheets allow you to try out several scenarios (wife applies at 62, husband applies at 66; wife applies at 66, husband applies at 70; and so on), so you can see what their combined benefit would be in 2019, 2020, 2021 etc. WEP/GPO Planning Calculator—Use this calculator when one or both spouses worked in a job that was not covered by Social Security and will be receiving a pension from an alternate retirement plan (commonly teachers and government workers in certain states). Survivor: Surviving spouses face a complicated set of claiming rules. The amount of a survivor benefit depends on both when the survivor takes her benefit and when the decedent took his benefits. It’s also possible to strategically coordinate survivor benefits with retirement income benefits. The Survivor Planning Calculator helps widows and widowers determine when to claim their survivor benefits. Divorce: Divorced clients face a unique set of rules when claiming Social Security. Use the Divorce Planning Calculator to devise scenarios for your divorced clients. The calculator will show lifetime benefits for your divorced client and produce suggested scenarios. “I have helped several widows who have lost their husbands at a relatively young age, and had either forgotten or simply did not know they could be eligible for the spousal benefits. This has occurred multiple times. 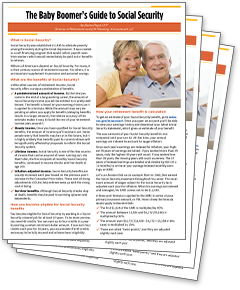 Marketing Kit for Social Security Planning for Boomers: Now it’s even easier to promote your client education workshops with these workshop descriptions, brochures, posters, invitations, and press releases. Post a promotional video on your website! Put a 90 second video on your website to promote your next workshop or seminar. Simply embed the video onto your website and customize the time, date, location, and RSVP fields. Savvy Social Security Planning is not just for pre-retirees who have yet to claim their benefits. It’s for anyone who suspects (or whom you suspect) may not be receiving all the benefits they are entitled to. It’s happened: spouses who never added on the spousal benefit after their husbands filed; widows and divorcees from multiple marriages claiming on the wrong spouse’s work record; early claimers who still have a chance to suspend their benefits and build 8% annual delayed credits. The Social Security Audit will not only help identify additional Social Security benefits a client may be entitled to, it could also shine a light on financial planning issues that need attention: IRAs that need consolidating or converting to Roth IRAs; portfolios requiring rebalancing; the need for certain financial products based on changing circumstances and goals. For prospects, the Social Security Audit serves as a first step, allowing you to give something of value while the two of you get to know each other better to see if there’s a fit. For clients, the Social Security Audit can be added to your financial planning checklist to make sure benefits are being maximized to the extent possible. It may also uncover new areas needing attention. This one-page checklist asks the questions you need answers to in order to determine if a client is receiving all the benefits they are entitled to—and may inform the rest of your financial planning work with clients. It also provides educational opportunities when, for example, a client wants to know why you are asking a certain question (e.g., how long a previous marriage lasted). In short, it establishes you as a professional who is very thorough in addressing your client’s financial matters. Your Path to Greater Expertise! In a perfect world, your clients wouldn’t be confused or concerned about Social Security. They could just schedule an appointment at the local Social Security office and then pad on down there to easily resolve any questions or issues. But it’s not that easy or simple. First, Social Security is the epitome of a large, unwieldy—some would say unresponsive—government bureaucracy. Second, Social Security should not be viewed in isolation. The hard issue of retirement income replacement needs to be analyzed in a highly personalized, one-on-one manner, one that takes into account all of a person’s sources of retirement income. Social Security can’t and won’t do that. Third, your clients will crave peace of mind regarding their retirement. Receiving a personalized, break-even analysis of their Social Security decision will go a long way toward engendering that warm, positive feeling clients seek. Putting aside do-it-yourselfers, people are going to need and will seek out advice on this crucial issue. Financial advisors are the professionals best positioned and equipped to address these issues for clients and prospects. “Probably the best story is my own. Until going through your program, I was pretty much convinced that I would take SS benefits this year, but after going through scenarios based on my and my wife’s (who is 6 years younger) benefits it became clear to me that waiting as long as possible is the wisest move. You Need to Master the Social Security Debate Issues. Over the coming months and years, Social Security will gain increased prominence as an issue that transcends politics and takes root as a key, nitty-gritty issue among many of your clients. You’ll be called upon to express a knowledgeable and considered opinion on this key aspect of retirement income replacement. It’s no longer viable—indeed, probably unwise—to subscribe to the notion that Social Security is “broke” or won’t be there for clients. The “Savvy Social Security Planning for Boomers” program will help you achieve and maintain mastery over this crucial client retirement issue. Your Clients Need Help. When you lead your clients through the Savvy Social Security Planning program, both of you are accomplishing important goals. Your clients will have experienced a real sense of accomplishment in reviewing their Social Security earnings record, analyzing their potential benefit options, and seeing how the replacement income fits with their other resources. More than nearly all client events, knowing and understanding how Social Security works and fits into their lives will be concrete, real-life information. For you, the advisor, the activity of leading people through the program confers “expertise by action.” You’ll be demonstrating your professionalism and showing people the value you add to the advisory relationship, again, in a real-life scenario. It’s a client event with an important outcome. It’s a Retirement Income Opener. Social Security, of course, is just one piece of the retirement income puzzle. By getting clients and prospects into a meeting or event to look at their personal situation with Social Security, they’re also getting a real-world view of the total retirement income picture. It all seems a lot more real and a lot less abstract and theoretical. Focusing on the “income replacement” aspect of Social Security naturally begs the question of what specifically the other pieces of their retirement income puzzle will be. The demonstration of your high interest and expertise in the Social Security issue—and your position as the person who has solutions to common retirement income problems—means, naturally, that people will see you as a good person to turn to and recommend to others for the bigger retirement income issues, as well. It Will Elevate Your Position Within Your Community. When you present the “Savvy Social Security Planning for Boomers” event in your community—either among your networks of clients and their friends and family, or more widely in your area—you’ll actually be doing a public service. People need this information. They want to know more about the program that they’ve contributed to through every paycheck they’ve ever received throughout their entire lives. And they’re not going to find anywhere else—either online or at the local Social Security office—the kind of information that you’ll be giving them with the Savvy Social Security program. Your status and reputation within your community will be enhanced through your delivery and mastery over the Savvy Social Security information. People will be gratified and appreciative that you’ve taken the time to learn this issue and make available to them the opportunities to learn more. You’re the Expert. Stay That Way. We already know that operational Social Security knowledge is fairly low among advisors. Many indicated they want to learn more because they see it as a real need—they’ve had questions over the years and answered them, perhaps, in fits and starts, not with the kind of confidence they’d prefer and that people should expect from a financial professional. By committing to the Savvy Social Security Planning program, you’re covering yourself on an important topic. As long as you remain in this business, people will have questions about this topic and your wisdom and insight will be sought for that reason. There is no better way to ensure that you achieve a high level of understanding about the key Social Security issues your clients and prospects face than by participating in the Savvy Social Security program. Year in and year out you’ll be buoyed and supported by this unique Horsesmouth program as you guide clients and prospects through this thorny first step of planning their retirement. Enhance your expertise today by putting Savvy Social Security Planninginto your client education program right now. You’ll be happy you did. 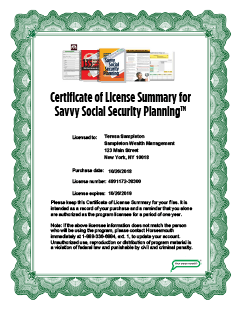 When you become a subscriber, you’ll be licensed to use the Savvy Social Security Planning for Boomers program with all your clients and prospects for a whole year. FINRA has reviewed the client presentation and client reference material for this program for a member firm and stated “the material submitted appears consistent with applicable standards.” (Reference: FR2008-12-17-0224/H). Like all such client materials, advisors need to consult their own compliance department. 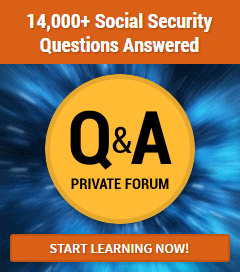 The Savvy Social Security Question and Answer Forum.It’s the largest collection of Social Security Q&As anywhere. More than 14,000 advisor questions and Elaine Floyd’s answers are all there. Read through previous Q&As or enter your own question and start learning. Grant CPE Credits to CPAs. Horsesmouth is now an official CPE continuing education (CE) sponsor. Present Savvy Social Security Planning for CPAs and Attorneys and now you’ll have the option to give CPA attendees CE credit. Twice-Monthly Newsletter Delivered to Your Email Inbox: Each issue is packed with information and updates from Elaine Floyd on the latest Social Security news, claiming strategies, program updates, and answers to difficult questions. 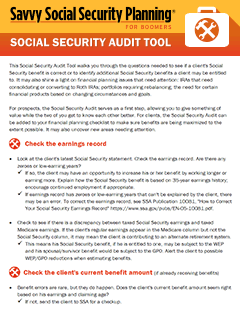 Social Security Audit Tool: This one-page checklist asks the questions you need answers to in order to determine if a client is receiving all the benefits they are entitled to—and may inform the rest of your financial planning work with clients. Each FINRA-reviewed presentation comes with PowerPoint slides and speaker notes. Savvy Social Security Planning: What Baby Boomers Need to Know to Maximize Retirement Income.This is a customizable client education presentation—licensed to you by Horsesmouth—to give to your clients or prospects. You can deliver it as a workshop or seminar, or in a smaller setting, even one-on-one. 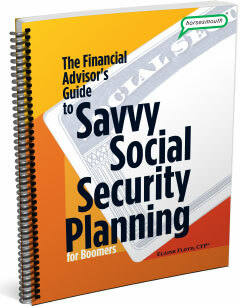 Savvy Social Security Planning for CPAs, Attorneys, and Other Professionals. CPAs and attorneys are an advisor’s best source of referrals. They work with clients who also need a financial advisor’s services, and a recommendation by a trusted professional is as good as gold. Present Savvy Social Security Planning for CPAs and Attorneys and now you’ll have the option to give CPA attendees CE credit. Savvy Social Security Planning for Couples.Spousal benefits are one of the least understood aspects of Social Security. The media attention on claiming strategies for married couples is making people aware of such strategies, but it is also causing great confusion, as reporters get the facts wrong or clients misinterpret the rules. We are seeing evidence of this in the questions clients bring to their advisors. Savvy Social Security Planning for Women.This presentation shows women how they can maximize Social Security by taking advantage of spousal benefits, survivor benefits, divorced-spouse benefits, and even divorced-spouse survivor benefits. It will open the eyes of Baby Boomer women who haven’t given much thought to Social Security, and may even be the launching pad for finally getting around to addressing their retirement planning needs, including a search for an advisor who can help them with the process. This presentation is suitable for all women including those already on Social Security, as well as younger women who may be helping their parents. Men should be invited too, for they have wives, sisters, and mothers who all need help with Social Security. Savvy Social Security Planning: Basic Rules and Claiming Strategies takes the general client presentation and strips out some of the detail, leaving your attendees with a few main points they should walk away with: why delay benefits, how spousal benefits work, how survivor benefits work, and what they should know before filing for Social Security. What’s New With Social Security? 7 Things to Watch in 2019 is for previous workshop attendees and tells what’s new for 2019, including COLA numbers, Medicare premiums, restricted application eligibility, coordination of Social Security with IRA RMDs, status of the Social Security Trust Fund, and the latest on Social Security reform proposals, of special interest in the first year of a new administration. This workshop will be updated at least annually and throughout the year as warranted. Social Security Quick Reference Guide, 2019 (PDF): This reference contains lots of handy facts and figures in an easy-to-read format. 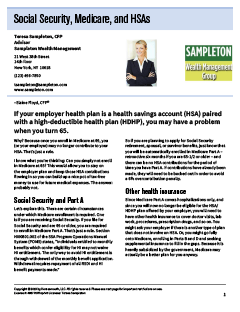 Information includes estimated PIAs for high earners, a breakdown of the actuarial reduction, Medicare premiums and more. A complete client education program like this is typically priced anywhere between $1,000 to $5,000. If you hired a marketing consultant and Social Security expert to pull it together for you, you’d pay $10,000 to $15,000 and you’d never be totally certain that what you were saying and doing is the right approach. That’s not what we have in mind for you. How Do You Build a Prosperous Business, Raise a Family, Support a Spouse, and Contribute to Your Community—All While Leading Your Clients Safely Into the Future? It’s a sad truth that few in this world really understand how difficult your job is and how rewarding it can be when pursued with passion, drive, determination, intensity, devotion, and dedication. Thankfully, one of our own totally understands you and your profession. His name is Bill Smith, CFP, a 30-year veteran advisor from San Francisco and a long-time Horsesmouth columnist. Leadership can feel lonely. But rest assured that you’re not alone. And the world has successfully made its way through periods this difficult in the past. The Land of Milk and Honey is just over the horizon. 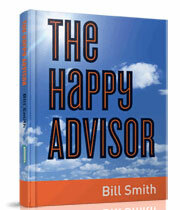 Bill Smith’s uncommon wisdom can provide the perspective you need to survive and thrive. During more than 35 years as a successful advisor, Bill has analyzed every challenge and obstacle one could possibly face in the pursuit of a successful business. And he’s come up with fresh approaches for overcoming each one. The Savvy Social Security Planning for Boomers program is $597 (plus shipping) if you order today for your first year (a $3,118 value). I think that’s an extraordinary value for the price—considering the importance of the topic and the amount of business you stand to gain from sharing this essential information with clients and prospects. But for right now, I’m making the absolute best offer possible. It’s been a difficult year for advisors all around and I really want the good folks in this industry to start looking ahead and start thinking about what good, positive things can happen. Savvy Social Security Planning for Boomers a key client-service offering for your pre-retirees and their friends and families. The coming retirement wave presents a unique and sustained opportunity for you to extend and enhance your reputation. Learn the program. Present it to your clients and prospects. Use it one-on-one and in group settings as a client education workshop. Do that for 12 months. If you’re not finding that your clients and prospects are extremely grateful to have a competent, confident, and knowledgeable advisor guide them through the ins and outs of Social Security, we’ll completely refund 100% of your purchase price—guaranteed, no questions asked. Just call and tell us you’re returning all the materials to Horsesmouth at: Horsesmouth, 21 W. 38th St., 14th Fl., New York, NY 10018. Phone: 212-343-8760, Ext. 1. You Wouldn’t Do This to Your Clients, Would You? If a client had a question about required minimum distributions you’d never send them to the IRS for the answer, right? Right. It needs to be the same for Social Security questions. Yes, of course, when it comes to actually applying for benefits, your clients will need to go down to the local Social Security office and complete some forms and get the ball rolling. But you’d never just suggest that they count on the Social Security Administration for the bigger answers of where and how their benefits fit into the bigger retirement income issue. That’s why you need to take charge on this issue—here is where you demonstrate leadership and expertise. You’ve got a chance to project competency and mastery and confidence on this very important issue. Clients’ peace of mind and their own sense of freedom and autonomy and independence in retirement depend on getting the question right. That’s why they’ll want your help as an expert. And that’s why they’ll be loathe to count on a government bureaucrat to help them. Putting Savvy Social Security Planning into your client education mix is the way to go.